Contamination referred to the presence of unwanted living (microbes) or non-living (impurities; such as dust particles) contents. 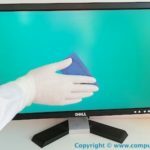 Computer and keyboard bacterial contaminations are found on the surface of its exposed parts at work workplace and another share environment such as schools, colleges and universities. They act as the main medium of transmission of many bacteria from one person to another. Contamination can occur everywhere in the environment whereas microbial contamination is the most alerting and common of them. Computer, keyboards, and mice in the office environment have multiple users, they are more exposed to contamination. When you start working on a computer that has already been used by another person, the bacteria that is present on their hands contaminated the keyboard and mouse and as soon as you start working on that computer. It is most likely that the pathogens present on the keyboard or mice may be transmitted to you. In the workplace, contamination of the office environment (including the computer keyboard and mouse) with bacteria is also recognized (Hirsch, 2005).The increased availability of multiple-user computers in the university setting means that these items or equipment are handled by numerous users on a daily basis. 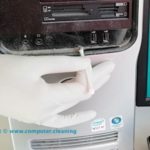 Given that computers are not routinely disinfected, the opportunity for the transmission of contaminating microorganisms is potentially great. Our understanding of the ubiquity of microorganism in the environment is developing, but the risk or hazard of contamination posed by the computer keyboards and mice is not yet fully understood. Most people do not realize that microbes are found on many common objects outdoors, in their offices, and even in their homes. Such objects include; playground equipment, ATM keyboards, kitchen sinks, office desks, computer keyboards, escalator handrails, elevator buttons and with the spread of supermarkets and hypermarkets, the shopping carts handle. All of the latter objects are places that are most touched by the bare hands of people who are in various hygienic conditions. People believe that microbes are only present in research labs or in hospitals and clinics and thus they have a misleading feeling of security in other places. Lack of knowledge about where germs prowl could be the cause of health problems. In fact, 80% of infections are spread through hand contact with hands or other objects (Reynolds et al., 2005). Reynolds used an invisible fluorescent tracer for artificial contamination of public surfaces, they found that contamination from outside surfaces was transferred to 86% of exposed individual’s hands and 82% tracked the tracer to their home or personal belongings hours later (Reynolds et al.,2005). Enterococci have been found to survive in dry conditions and on various fabrics utilized in the healthcare environment. Infectious doses of pathogens may be transferred to the mouth after handling an everyday contaminated household object (Rusin et al., 2002). Recently (Ulger et al., 2009) have demonstrated that health care workers’ hands and mobile phones were contaminated with various types of microorganisms and concluded that mobile phones used in daily practice may be a source of nosocomial infections in hospitals. Scientific information about the occurrence of bacteria on various objects outside the healthcare facilities is very little and needs to be enriched in order to educate people on the necessity of improving the habit of hand washing to reduce microbial transmission. The aim of this study was is to investigate the presence of bacteria on 4different objects (computer keyboards and computer mice, elevator buttons and shopping carts handles) that are frequently used by people in the city of Jeddah, Saudi Arabia. (Ulgeret al., 2009). 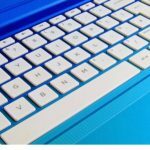 The environmental conditions vary depending on temperatures around the keyboard and whether or not the keyboard is on a laptop. If the keyboard is on a laptop it could possibly provide heat and moisture for long enough duration to have an effect on bacteria such as Enterococcus, which is known to survive a wide range of environmental conditions. Studies have shown, however, that the presence of serum or albumin (known contaminants on keyboards touched by wet gloves), and a low temperature, with high humidity results in the longer lifetime of bacteria on the contaminated surface. Many nosocomial pathogens can also survive on dry inanimate surfaces for months (Kramer et al., 2006). The present study showed that microbial contamination occurs on computer surfaces located in a university setting and may reflect the multiple-user environment where the possibility of contamination by individuals who are carriers of bacteria such Staphylococcus aureus is greater and the isolation of viable microorganisms suggest that the species present are able to persist for a period of time on these surfaces. It is suggested that computer keyboards and mice in institutions may act as a vehicle for the transmission of pathogenic organisms (Anastasiades, et al., 2009). The computer keyboard and a mouse have a very dynamic environment. Food and drinks are commonly consumed in front and on top of the keyboard. This provides a constant source of food for anything that may be living there. Since the keyboard is constantly in contact with human hands, there will constantly be a stream of things leaving the hands and entering the keyboard or of course, leaving the keyboard and entering the hands. In the former case, bacteria from different niches could be transferred over if the hands have not been sanitized. In the latter case, already preexisting bacteria will start to grow will transfer onto the hands and then onto the new surfaces that the hand will come into contact with. There are many communities that come into contact with the keyboard. In general, the bacteria that live on our skin, fingernails, hands, and anywhere the hands have been are likely to transfer new bacteria over to the keyboard. In a place where there is a lot of people moving in and out, such as a hospital or office, there is likely to be a good number of people that are sick, and through them comes the new bacteria that will eventually settle on the keyboard through the air or from physical contact. 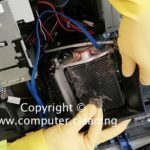 Cleaning our keyboard and mice regularly is another smart solution that most people ignore; only about half of the computer users in the average office environment clean their computer keyboards at least once a month. Of course, sharing a keyboard with multiple people makes it a much more dangerous surface when it comes to passing diseases. If we use our own keyboard and mouse and nobody else uses it, then the chances of that keyboard and mouse serving as a method of transmission are fairly small, but where sharing keyboard is concerned there is a higher probability of transmission occurring. We can clean in between the keys of our keyboard with compressed air (i.e. canned air) on a monthly basis, and we can also use canned air to blow out the fans and vents on our computer regularly too. We can also wipe the surface of the keys and keyboard with anti-bacterial wipes regularly for the best protection.